If the world were a constant, ONE recipe for high performance would last forever. Unfortunately, this is not the case. Change is a constant, resulting in obsolete products, services, resources and business models. 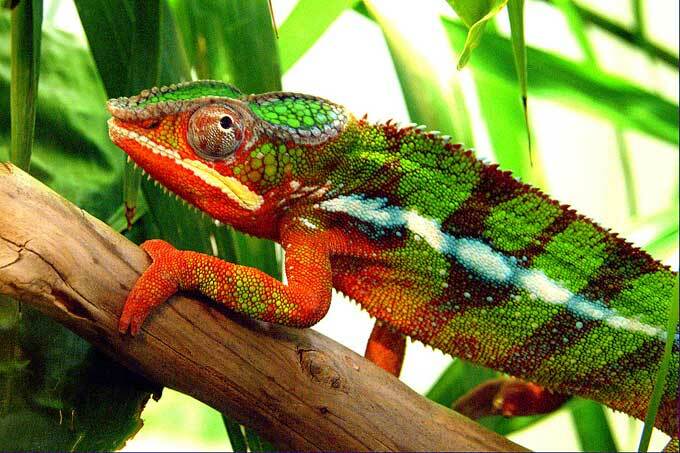 For High Performance Organizations it is therefore very important to be adaptive to change. Successfully adapting to change will make all the difference for a company's survival. This all might seem obvious to you, however successful change is still seldom. The bigger the change and the larger the organization, the more focus and change efforts are needed from management. Watch out! Our iceberg is melting! We all have seen world leading companies go out of existence after changes in the environment. And we all ask the same question: How could this have happened? To survive in today's market place, a business must constantly examine its strategy, processes, systems, and ultimately its performance to understand what changes need to be made . at the same time, an organization must also understand the implications of new business change on its employees, given its culture, values, history capacity for change. Employees ultimately perform the new day-to-day activities and make the new processes and systems come to life in the business. Change management is about managing people in a changing environment so that business changes are successful and the desired business results are delivered. The challenge facing leaders today is that they need to manage change both top down (organizational change) as well as bottom up (individual change). The top down approach focuses on communications, training and the culture and overall value system of the organization. The individual change process has leaders focus on providing coaching and guidance to help the employees come to terms with their new/changing roles. In literature there are a number of approaches to change management. From an organizational perspective you have Kotter's famous 8 steps to effectively implement change as well as Prosci's 3 phase approach to change. To support individual change there is the ADKAR process (Prosci). In his famous book "Leading change" that came out over 15 years ago, John Kotter, proposes a change process, that needs to pass through 8 stages in order to be really successful. Sense of urgency: there is no change without a good reason to change. Forming a guiding coalition: the guiding coalition are the real advocates of this change, They could be throughout the organizations and on different levels. They are the real change agents. Compelling vision: there needs to be a true belief within the organization that the change is for the greater good and that it is needed for the company's future. Clearly communicate the change vision: leaders should take every opportunity to reiterate the need for change and most importantly to "walk the talk" displaying the belief in the change. Empower broad based action: senior management should clear away any obstacle in the way of change. Systems and structures that hinder change will need to be removed and thinking differently needs to be encouraged. Short term wins: planning for short term wins (and achieving them) are important; they demonstrate that the change is for the good and is actually working. Openly recognizing and rewarding success by staff members fuels new ambition and dedication. Consolidate change: in this stage new change agents are formed, spreading the change even further within the organization. Increased credibility of the change will allow for more and quicker changes of obstructing systems. Anchor new approaches in the culture: as described in the framework as part of the organization, culture is important, but very difficult to change. Clearly stating the relationship between new behaviors and the improved results due to the change will result in the adaptation of the culture, to remain a high performance one. Assess the scope of the change: how big is it? How many people will be affected? Will it be a gradual or radical change? Assess the readiness of the organization impacted by the change. What value system is impacted by the change? What change is already going on? What type of resistance can be expected? Acquire project resources and assess the strengths of your change management team. Phase 3- Reinforcing change: this phase focuses on the reinforcement of the change by continuously monitoring change activities and taking corrective actions when needed. This phase is the most important one and in practice management often forgets to fully complete this phase, resulting in a less than perfect change. Also developed by Prosci is a model aimed at assisting individuals to go through the change. Ultimately it will be the individual people that need to change. 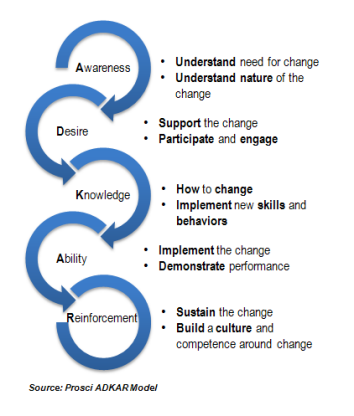 According to the model, all individuals will need to go through five stages of change. The speed by which each individual will go through each stage will differ from one person to another, but all will need to go through ALL these phases in order to fully accept the change. This model can be used as a tool for self-awareness, gap analysis, resistance analysis, coaching and the development of corrective actions. The picture below indicates the 5 phases of the model.